Posted 10/18/2018 2:02pm by Leslie Cooperband or Wes Jarrell. The underlying physiological response to shorter days is slumber. The farmer’s cognitive need to keep going fights against the brain’s automatic emission of chemical rivulets to slow down, to let go. Despite the slow-down in milk production that normally accompanies breeding, there are still so many things to do before the season truly ends. The early morning temperatures left a light frost this week, just enough to blacken the tips of the summer crops, but not enough to do them in all together. The still green tomato vines need to be cut down and hauled to the compost pile. 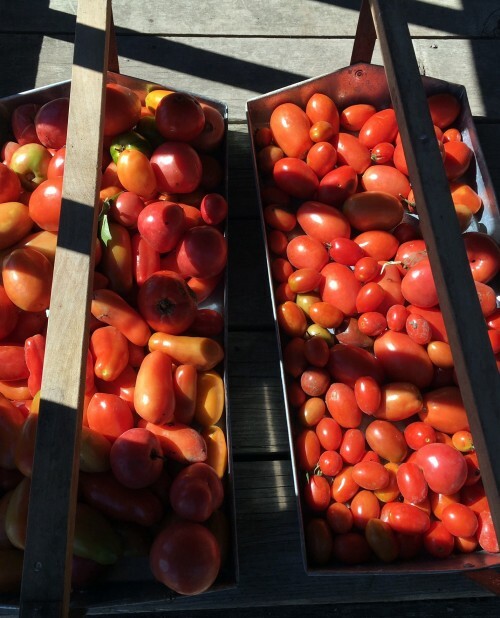 The now rotting green and red tomatoes that have fallen to the ground need to be raked and carted away, so they don’t release their seeds into the soil to create a volunteer tomato weed patch next spring. The kid barn needs to be cleaned in anticipation of November breeding. The compost windrows need to be turned and, eventually, the finished compost needs to be spread on the pastures to begin the slow re-nourishment of the soil (and make room for more compost). The desiccated tree fruit mummies (fruits that were diseased or insect damaged that rotted on the limbs or fell to the ground) need to collected and burned. Time spent on fall hygiene supposedly helps lessen the insect and disease pressure for next year. The orchard ground cover needs to be mowed to create an inhospitable environment for the voles who might think about winter “camping” and tree root “pruning” under snow and frozen ground. When the wind is just right, and the tinder not too wet or dry, we’ll need to light our giant burn piles on fire. We’ll need to get rid of this year’s organic debris to make room for next year’s. The ebb and flow of abundance and scarcity of products and by-products are normal. Mustering the energy and enthusiasm to bring order to the natural entropy can be challenging. Text Message Customer Loyalty Program: This week’s text club special relates to green peppercorn moonglo. To get the message with the special info, you’ll need to sign up: text either “GOAT” or “URBANA” or “FARMSTORE” to 30500 to sign up. The forecast is calling for seasonal temperatures—this means cool—and a bit breezy. This is the time of year that folks forget how much great local food is still available at the farmers’ markets. Take an hour out of your Saturday morning to patronize the farmers who provide you with beautiful, locally-grown produce. 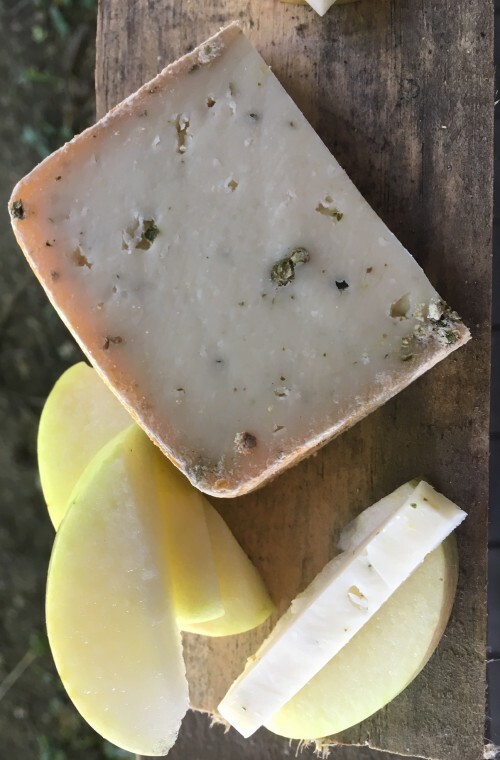 Our cheeses compliment so many of the fresh produce available now—fennel, carrots, radishes, apples and pears. 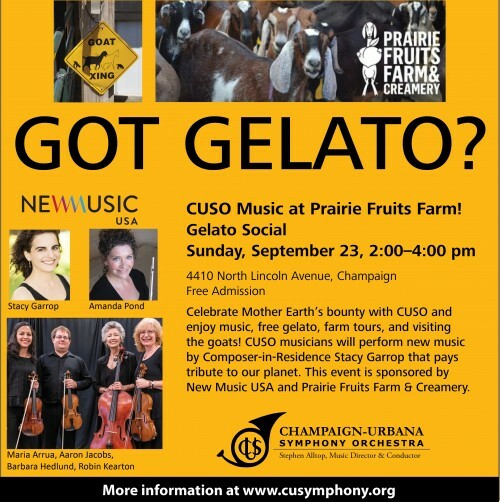 We continue to have a great line-up of cheeses, especially chevre, as well as gelato flavors for you, so come out and support your local farmers this Saturday. If you can’t make it to the market, our farm store is open Friday evening, 4-7 pm, Saturday and Sunday, 1-4 pm. Fresh chevre: plain, herbs de Provence, cracked pepper-late summer/early fall milk is making some rich chevre-start stocking up and throw some in your freezer for winter. Roasted poblano chevre: poblano peppers grown on our farm, gently roasted to remove the skins, chopped and blended into our fresh chevre. Slight heat from the peppers, cooled by the creamy chevre; need I say more? Try it on a crostini with pan-roasted mushrooms. This may be the last weekend it is available. Little Bloom on the Prairie: This batch aging nicely; slightly gooey on the edges, buttery, milky and slightly mushroomy. Enjoy a wedge with local honey or jam. Black Goat: an ash-coated bloomy rind cheese with a delicate and crinkly yeasty rind. This batch is starting to get gooey and ripe but not overly ripe. It still has a wonderful yeasty aroma and a tart lemony taste. This cheese pairs well with sliced pears or try with a reduced balsamic vinegar. Moonglo: Our first spring milk batches of this raw milk tomme (sort of like a Gouda, but not really) are making their debut at the market and in the farm store. The spring milk produces a lighter, tangy paste with hints of pineapple. The texture of the cheese is a bit more firm than fall milk batches. Melts well, or just slice and enjoy with your favorite salami. Green Peppercorn-Barley Wine Moonglo: another spring-milk experiment. Just before the curds had set in the vat, we add cracked green peppercorns and a touch of a local barley wine. The cheese wheels have been aging for nearly five months, and the verdict is complex deliciousness. The green peppercorns give a hint of floral pepperiness, the barley wine provides a bit of sweetness; the combination is sure to delight. THIS IS MY ‘PERFECT PAIRING CHEESE’ THIS WEEK, PAIRED WITH FRESH APPLE SLICES. Lunar Eclipse: Earlier this spring, when milk was plentiful, we experimented with a cheese make that attempted to hybridize our “Magia Negra” (a Manchego-style cheese with a black currant rub on the rind) with our Moonglo. Lunar Eclipse is the same size as our Moonglo wheels, but has a very different paste texture and flavor profile. The paste is slightly dry and crumbly, making it suited to both slicing and grating. The flavor has hints of tannins from the black currant rub. It looks like the dark side of the moon, but the flavor will put you over the moon. If haven’t figured out yet where we are at the market this year: Urbana Market at the Square. We are in spot #20 on the south-west (along Illinois Street) end of the market. We are right next to Moore Family Farm. The outdoor market goes until the end of October this year, then, we will be moving inside Lincoln Square Mall starting November 3rd. The market DOES NOT end once it moves inside; it’s just a change of venue. We have new hours through the end of October: Fridays, 4-7 pm and Saturdays and Sundays, 1-4 pm. Now that the weather is cooler (hopefully), the farm is a great place to visit and to shop. On Fridays, come out after work to unwind. During our open hours, you can savor a scoop of gelato or “build your own” cheese boards—pick out your cheeses, add a stick of salami (Underground Meats) or a jar of jam from Autumn Berry Inspired, our own house-made jams or pickled veggies, grab some Central IL Bake-house or Bread Co. baguette bread and we’ll provide the board. Now, through the end of October, Michael Darin, our “wine guy” returns to farm for Friday low-key happy hours, 4-7 pm. He’ll offer tastings and suggestions for special cheese and wine pairings each Friday evening. It’s a fun way to try some new wines and/or local micro-brews alongside our cheeses. Check out the details. Shop in our farm store “The Real Stand.” In addition to our cheese and gelato, we’ve got pasture-raised meats and poultry from Bane Family Meats, frozen artisan sausages from Piemonte Sausage Co. (Bernie’s Classic Sweet, Cantalupo and Chicken Apple are back in stock as well as bulk chorizo sausage), jams and pickled veggies by Sarah (our former gelato maker), locally-grown and milled flours by The Mill at Janie’s Farm and much more. PFFC goat meat—we have one pound packages of stew meat (1 lb. packages, $13/lb.) and leg shanks (2 to a package, $16/lb.). We also have shoulder roasts (approx. 4-5 lb. packages, $16/lb.). Pasture raised, very lean and mild, try the meat that most of the rest of the world enjoys regularly. Apple Cider pressed from Red Crib Acres apples—we hand pressed apples into delicious, refreshing cider. Fresh apples from Red Crib Acres: Winesap (one of my favorite late fall varieties) and Galarina (a French Gala variety). Two Million Blooms Honey: we’ll have 1 lb. squeeze bottles and 4 oz. and 1 lb. fancy bottles for sale this weekend. Their honey is beautiful and sweet. Sunday, October 21st Cider Dayz at the Farm--mark your calendars for our second annual fall apple cider festival. From 1-4 pm, you’ll be able to press your own cider, enjoy a cider-gelato float, grab some fresh apples and savor some cider-inspired pastries by Lucky Pierre Bakers. We’ll be offering hay rides around the farm too: $5/adult, $2.50/child under 8 yrs. old. RSVP on our Facebook page. Delight Flower Farm will be offering a fall wreath making workshop in our pavilion from 3:00-4:30 that same afternoon. Reservations required for the workshop. 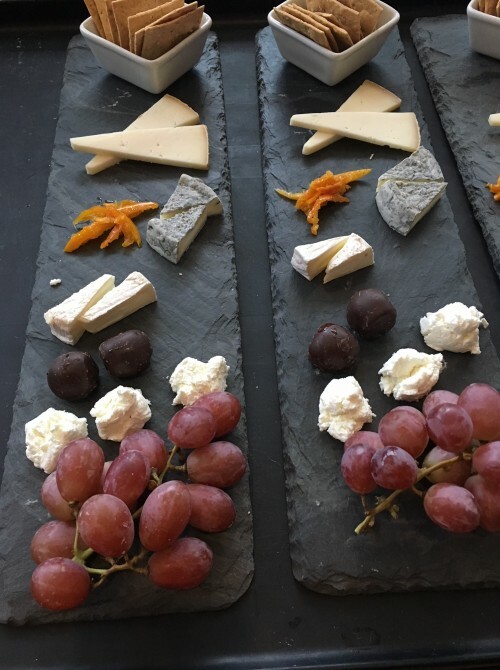 Fall Weeknight Classes: We’ll be offering a series of evening classes in November and December: wine & cheese, beer & cheese, cheese basics and cheese board building to name a few. Stay tuned for dates and registration information. Holiday Time on the Farm: Once again, we will be transforming our farm store for the holidays. Starting November 24th (Saturday after Thanksgiving) and through December 22nd, the farm will have extended weekend hours. Goats dressed up in holiday attire for picture taking, hay rides, warm spiced drinks and even a seasonal Pop-Up Café are in the works. Stay Tuned for Details! Posted 10/12/2018 9:06am by Leslie Cooperband or Wes Jarrell. In the cyclical life of a farmer, sometimes waiting permeates the week’s activities, while other times, you are thrust into radical change. This week, the clouds and winds left a 40-degree temperature drop in their wake, setting into motion a flurry of activity more appropriate to the season. After weeks of distant pinning and unmet amorous frustrations, the breeding bucks finally were brought up to the doe barn to begin breeding. When we went over to the north pasture to retrieve them, we brought a bucket of grain, thinking we would need to coax them out of their summer pasture. This gesture proved totally unnecessary. Like missiles programmed to strike their targets with laser-like precision, they jaunted up through the orchard (Nate was actually galloping) toward the doe barn. 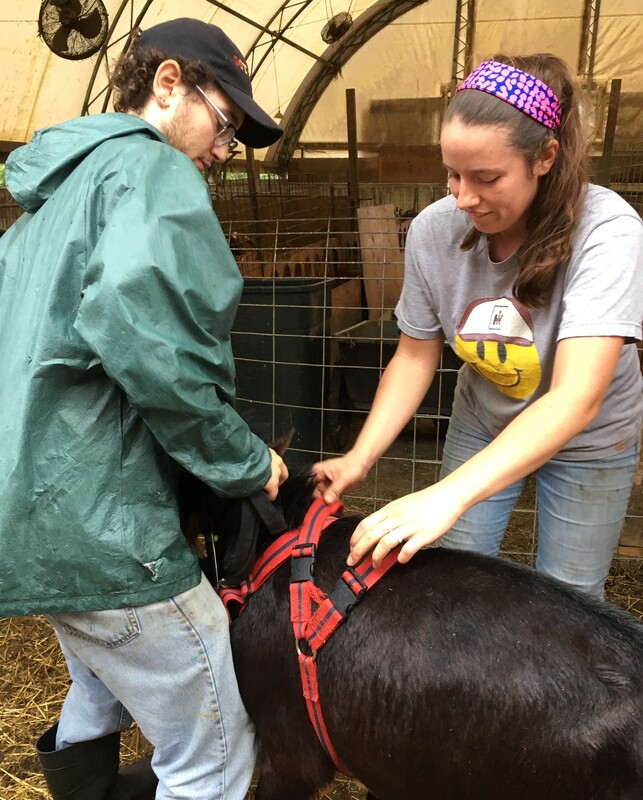 Erica and Zev both had to restrain them to put the marking harnesses on each one before letting them into their breeding pens. Within minutes of releasing them into their pens, the courtship rituals of flagging (does waving their tails), urine analysis (bucks testing the does’ urine for estrous hormones) and even mounting the few in standing heat ensued. After a couple of days, the males and their harems are settling into their new routine with occasional bouts of jealousy if someone else’s does come into heat. So, we begin the simultaneous creep toward the end of this year’s lactation cycle with the first steps toward next year’s production. As new beginnings stir in the doe barn, the bonus garden crops from delayed summer must now be harvested before the coming frosts. Yesterday, I spent a couple of hours pulling off ripe and green tomatoes, peppers and any other cold sensitive crops from their vines. My feelings were conflicted—wanting to hoard every single ripe tomato, even those that had fallen to the ground versus accepting that it is ok to leave a few to rot or be eaten. Despite my better judgement, I was overcome by a sense of last chances, the strong need to glean all of the year’s harvest. It is hard for me to let anything go to waste (perhaps of so many years of childhood indoctrination into the “clean plate club”), even though I know our freezers are full of frozen fruit and veggies. Just a few more pickles to make, a few more jars to fill and line the shelves. Text Message Customer Loyalty Program: This week’s text club special is still about chevre. To get the message with the special info, you’ll need to sign up: text either “GOAT” or “URBANA” or “FARMSTORE” to 30500 to sign up. The forecast is calling for seasonal temperatures—this means cool—but sunny. Perfect shopping weather-lots of farmers will have the end-of-summer produce as well as fall beauties. We have a great line-up of cheeses, especially chevre, as well as gelato flavors for you, so come out and support your local farmers this Saturday. Roasted poblano chevre: poblano peppers grown on our farm, gently roasted to remove the skins, chopped and blended into our fresh chevre. Slight heat from the peppers, cooled by the creamy chevre; need I say more? Try it on a crostini with pan-roasted mushrooms. Little Bloom on the Prairie: This batch aging nicely; buttery, milky and slightly mushroomy. Enjoy a wedge with local honey or jam. Black Goat: an ash-coated bloomy rind cheese with a delicate and crinkly yeasty rind. This batch is aging well with a fudgy texture to the paste. It has a wonderful yeasty aroma and a tart lemony taste. This cheese pairs well with sliced pears or try with a reduced balsamic vinegar. Lunar Eclipse: Earlier this spring, when milk was plentiful, we experimented with a cheese make that attempted to hybridize our “Magia Negra” (a Manchego-style cheese with a black currant rub on the rind) with our Moonglo. Lunar Eclipse is the same size as our Moonglo wheels, but has a very different paste texture and flavor profile. The paste is slightly dry and crumbly, making it suited to both slicing and grating. The flavor has hints of tannins from the black currant rub. It looks like the dark side of the moon, but the flavor will put you over the moon (we hope). Green Peppercorn-Barley Wine Moonglo: another spring-milk experiment. Just before the curds had set in the vat, we add cracked green peppercorns and a touch of a local barley wine. The cheese wheels have been aging for nearly five months, and the verdict is complex deliciousness. The green peppercorns give a hint of pepperiness, the barley wine provides a bit of sweetness; the combination is sure to delight. If haven’t figured out yet where we are at the market this year: Urbana Market at the Square. We are in spot #20 on the south-west (along Illinois Street) end of the market. We are right next to Moore Family Farm. The outdoor market goes until the end of October this year, then, we will be moving inside Lincoln Square Mall starting November 3rd. The market DOES NOT end once it moves inside; it’s just a change of venue. We have new hours for the fall: Fridays, 4-7 pm and Saturdays and Sundays, 1-4 pm. Now that the weather is cooler (hopefully), the farm is a great place to visit and to shop. On Fridays, come out after work to unwind. During our open hours, you can savor a scoop of gelato or “build your own” cheese boards—pick out your cheeses, add a stick of salami (Underground Meats) or a jar of jam from Autumn Berry Inspired, our own house-made jams or pickled veggies, grab some Central IL Bake-house or Bread Co. baguette bread and we’ll provide the board. Starting October 12th and through the end of October, Michael Darin, our “wine guy” returns to farm for Friday low-key happy hours, 4-7 pm. He’ll offer tastings and suggestions for special cheese and wine pairings each Friday evening. It’s a fun way to try some new wines and/or local micro-brews alongside our cheeses. Check out the details. NEW: Delight Flower Farm has a self-service bouquet stand at the entrance to our farm! Get a gorgeous bouquet of fresh flowers for only $10!! Leave your $$ in their box via the honor system. Farm Dinners We only have a few dinners left this season, and all but one are sold out. I encourage you to book your tickets now for the remaining date (December 8th). It will be an early winter holiday celebration themed meal. We probably won’t post the menu for another few weeks, but I promise that we will end the dinner season in style. Sunday, October 21st Cider Dayz at the Farm--mark your calendars for our second annual fall apple cider festival. From 1-4 pm, you’ll be able to press your own cider, enjoy a cider-gelato float, grab some fresh apples and savor some cider-inspired pastries by Lucky Pierre Bakers. RSVP on our Facebook page. Posted 10/4/2018 4:16pm by Leslie Cooperband or Wes Jarrell. Despite the roller coaster temperatures that make it difficult to get on with fall, we pressed some apples this week for cider. Our cider press is old fashioned; it requires human strength to load the apples into the hopper (not so taxing), hand crank the chopper and then dial down on the chopped pieces of apples to expel their juice (most muscle required, especially upper body strength). Although this has become an annual ritual on the farm over the years, I always marvel at the golden caramel colored juice flowing from the white and yellow fleshed apples. One hundred pounds of apples yielded almost five gallons of cider: nectar of the pomme fruits. The brisk winds of late are carrying the buck mating odors eastward toward the pasture. The does are coming into heat in waves now. This morning, another early morning phone call from our buck keeper, Abad, alarmed that there had been another doe breakout into the buck pen. We rushed down through the orchard to find a line of does wailing along the fence line in the direction of their suitors. Wes watched Pattie, clearly in heat, test the hot wire with her nose; a gentle jolt gave her sufficient respect to not challenge the fence. Inside the buck pen, the bucks’ lips were curled up to test the winds for doe pheromones. Like the humpback whales who sing to their mates in the deep blue ocean, the wave of does in heat call to the bucks and the bucks respond with their own chants and snorts. The breeding males go after the remaining bucklings in their pasture paddock, practicing moves for eventual mating yet frustrated that they can’t have the real thing just yet. To get a first hand account of the serenading, go to our Facebook page. Text Message Customer Loyalty Program: This week’s text club special is all about chevre. To get the message with the special info, you’ll need to sign up: text either “GOAT” or “URBANA” or “FARMSTORE” to 30500 to sign up. The forecast is for pleasant temperatures (70’s to low 80’s) and a chance of rain. Don’t let the a few drops of the wet stuff slow you down-bring an umbrella. The market is brimming with so much goodness right now—the fleeting crops of summer and the sweetness of fall crops like apples, pears and carrots. We have a great line-up of cheeses, especially chevre, as well as gelato flavors for you, so come out and support your local farmers this Saturday. 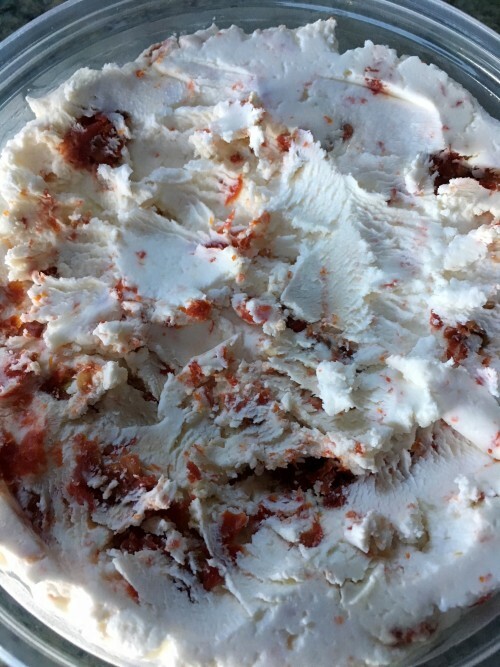 Fresh chevre with dried tomatoes: Last chance folks! We have a limited number of tubs of this intensely tomato flavored chevre. We grow the mini-Roma tomatoes called Juliette, dry them chop them up and then blend them into our fresh chevre. This is my favorite flavor of chevre. Roasted poblano chevre: poblano peppers grown on our farm, gently roasted to remove the skins, chopped and blended into our fresh chevre. Slight heat from the peppers, cooled by the creamy chevre; need I say more? Little Bloom on the Prairie: This batch is young but loaded with flavor; buttery, milky and slightly mushroomy. Enjoy simply on a slice of crusty bread with local honey or jam. Black Goat: an ash-coated bloomy rind cheese with a delicate and crinkly yeasty rind. This batch is young with a fudgy texture to the paste. It has a wonderful yeasty aroma and a tart lemony taste. If haven’t figured out yet where we are at the market this year: Urbana Market at the Square. We are in spot #20 on the south-west (along Illinois Street) end of the market. We are right next to Moore Family Farm. The outdoor market goes until the end of October this year, then, we will be moving inside Lincoln Square Mall starting November 3rd. The market DOES NOT end once it moves inside; it’s just a change of venue. We have new hours for the fall: Fridays, 4-7 pm and Saturdays and Sundays, 1-4 pm. Now that the weather is cooler (hopefully), the farm is a great place to visit and to shop. On Fridays, come out after work to unwind. During our open hours, you can savor a scoop of gelato or “build your own” cheese boards—pick out your cheeses, add a stick of salami (Underground Meats) or a jar of jam from Autumn Berry Inspired, our own house-made jams or pickled veggies, grab some Central IL Bake-house or Bread Co. baguette bread and we’ll provide the board. You can sit outside under our new pavilion roof and enjoy a glass of wine or beer with cheese! Starting October 12th and through the end of October, Michael Darin, our “wine guy” returns to farm for Friday low-key happy hours, 5-7 pm. He’ll offer tastings and suggestions for special cheese and wine pairings. 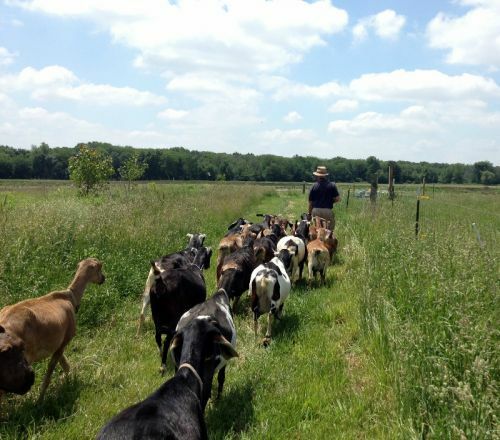 Visit with the goats-they will be in breeding pens starting October 10th. Walk through the orchard, or even take stroll down to our restored prairie. The farm has amazing natural beauty and the fall light, especially at the end of the day is surreal. Apples from Red Crib Acres (formerly Wolfe Orchard) in Monticello-we have three new varieties this weekend: Mutsu (large, crisp and tart), Jonagold (perfectly sweet-tart) and Smokehouse (a crisp, yellow fleshed apple that tastes like cider). $2.75/pound. Fall season is upon us, and most of the remaining farm dinners have sold out already. I encourage you to book your tickets now for the two remaining dates (Oct. 6th and December 8th). The beer dinner on Saturday, October 6th features Bane Family Meats pastured pork and beers from Triptych Brewery. Guest Chef, Mark Hartstein (currently cooking at bacaro, and was one of the co-founders of Watson’s Shack & Rail) and his partner, Leslie Bettridge (GM at Farrens) have crafted a gorgeous and creative menu to go with the wonderful and varied beers of Triptych Brewery. We still have a few tickets left for this event, so don’t delay. Sunday, October 21st Cider Dayz at the Farm-mark your calendars for our second annual fall apple cider festival. From 1-4 pm, you’ll be able to press your own cider, enjoy a cider-gelato float, grab some fresh apples (and maybe even meet the farm who grew them) and savor some cider-inspired pastries by Lucky Pierre Bakers. Delight Flower Farm will be offering a fall wreath making workshop in our pavilion from 3:00-4:30 that same afternoon. More details to come, but put this one on your calendars. Posted 9/27/2018 10:36pm by Leslie Cooperband or Wes Jarrell. Sometimes you have to bring the farm to the people if the people can’t get to the farm. The farm’s most frequent traveler-ambassador is our cheese. This week, I traveled north twice with my cultured (get it??) ambassador, first to Naperville and later to downtown Chicago. On Monday evening, I partnered with the talented cheese and wine staff of Standard Market-Naperville to co-host a wine and cheese pairing. The cheese monger crafted a show stopping board with chevre, little bloom, black goat and Moonglo and a range of accompaniments. The wine guy selected two whites and two reds from all over the globe (from Alsace to Washington State) to pair with each of the four cheeses. The group of 20 was lively and engaged. The pairings were spot on. I love opening people’s minds to new flavors and textures and blowing out their expectations about what goat cheeses should taste like. Wednesday, I was back in the truck headed north on I-57, this time loaded with coolers for Chicago cheese deliveries and a fall “Illinois Makers” festival in downtown Chicago—where Michigan Avenue meets the Chicago River. When we arrived, the folks from the Great Pumpkin Patch in Arthur had already erected their tower of cucurbits (that’s the scientific name of the family of pumpkins, squashes and gourds) in the middle of the city plaza. As we set up our booth, we watched the city people and tourists cluster around the squash tower, positioning themselves for photos, drawn to the beauty of nature like moths to a flame. The plaza ebbed and flowed with office workers in their city finest, strolling by the market tents, intrigued by the juxtaposition of farm fare with the towering eclectic sky scrapers. Tourists of many nationalities wandered up the stairs from the river, no doubt fresh from their boat tour. 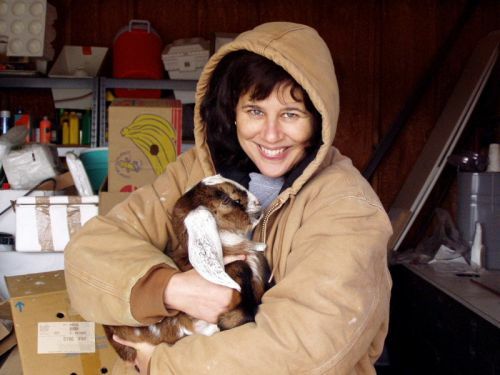 Again, the festival provided the means to employ cheese as a vehicle to engage people in conversations about central Illinois, farming, goats, seasonal milk and back to cheese. Who knew that cheese could change people’s expectations, force them to think outside their routine. While we were closing up shop at the festival, I got a frantic call from the gentleman (his name is Abad) taking care of our bucks this year. In Spanish (he is from Puebla Mexico), he excitedly reported that he had found one of the does in the buck pen. He had no idea how she got there, and it was clear she was in heat and had been mounted by one of our bucks. Trying to remain calm, toting coolers and other market paraphernalia toward the truck, I told him to bring her back to the parlor so she could get milked. This evening, after chores, Abad recounted the full story of this tale of caprine desire. When he got to the buck pen to feed them yesterday evening, he found the doe, Sabrina, on the outside of the buck pen, standing next to water trough. When she saw Abad, she knew she had been “busted,” and starting heading back through the orchard toward the barn. All of a sudden, she turned around, put the proverbial “petal to the metal” and launched into a full gallop back toward the buck pen. Abad stood in amazement as Sabrina vaulted herself gracefully over the top of the fencing and landed squarely in front of the object of her desire—Nate, our stately Nubian buck. Within seconds, Nate mounted her. Within minutes the other bucks in the pen were fighting for her attentions. The saying that a fence that can hold water is the only fence that can hold in a goat is apt, unless she’s a doe in heat, driven to seek out the scratch to sooth her itch. Text Message Customer Loyalty Program: This week’s text club special encourages you to stock up on cheese while the selection is good. To get the message with the special info, you’ll need to sign up: text either “GOAT” or “URBANA” or “FARMSTORE” to 30500 to sign up. Farmers’ Market Offerings The forecast is cool and sunny weather-perfect for market shopping. We have a great new line up of cheeses as well as gelato flavors for you, so come out and support your local farmers this Saturday. This is the time of year when summer produce is still abundant and fall crops are starting to make their appearances. The cooler weather is conducive to cooking, so come to the market and get inspired. Fresh chevre: plain, herbs de Provence, cracked pepper-late summer/early fall milk is making some rich chevre-stock up and throw some in your freezer for winter. Goat Milk Feta: Tomatoes are still plentiful and delicious. With the cooler weather, why not roast some tomatoes with crumbled feta and fresh chopped herbs? VERY LIMITED THIS WEEK, AND THEN ON A BRIEF HIATUS FROM THE MARKET FOR A COUPLE OF WEEKS. Little Bloom on the Prairie: This batch is young but loaded with flavor; buttery, milky and slightly mushroomy. Enjoy simply on a slice of crusty bread with local honey or jam. This week’s “perfect pairing” is little bloom with our house-made pear butter. 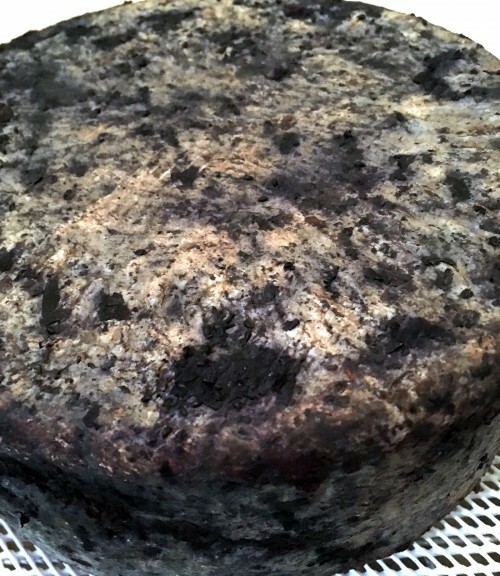 Black Goat: an ash-coated bloomy rind cheese with a delicate and crinkly yeasty rind. This batch is young and firm. It has a wonderful yeasty aroma and a tart lemony paste. We have new hours for the fall: Fridays, 4-7 pm and Saturdays and Sundays, 1-4 pm. Now that the weather is cooler, the farm is a great place to visit and to shop. On Fridays, come out after work to unwind. During our open hours, you can savor a scoop of gelato or “build your own” cheese boards—pick out your cheeses, add a stick of salami (Underground Meats) or a jar of jam from Autumn Berry Inspired, our own house-made jams or pickled veggies, grab some Central IL Bake-house or Bread Co. baguette bread and we’ll provide the board. You can sit outside under our new pavilion roof and enjoy a glass of wine or beer with cheese! Want to go the total sweet route? How about a root-beer float with a scoop of our gelato? Enjoy the changes of the season. Visit with the goats-they will be in breeding pens in a few weeks. They always love to be petted, and they might try to trick you into feeding them some hay. Walk through the orchard, or even take stroll down to our restored prairie. The farm has amazing natural beauty. Two Million Blooms Honey: we’ll have 1 lb. squeeze bottles and 1 lb. fancy bottles for sale this weekend. Can’t wait to have their honey back in the store. Farm Dinners: Fall season is upon us, and most of the remaining farm dinners have sold out already. I encourage you to book your tickets now for the two remaining dates (Oct. 6th and December 8th). The beer dinner on Saturday, October 6th will now feature Bane Family Meats pastured pork and beers from Triptych Brewery. Guest Chef, Mark Hartstein (currently cooking at bacaro, and was one of the co-founders of Watson’s Shack & Rail) and his partner, Leslie Bettridge (GM at Farrens) have crafted a gorgeous and creative menu to go with the wonderful and varied beers of Triptych Brewery, so check it out and grab your tickets before they’re sold out! Sunday, October 21st Cider Dayz at the Farm-mark your calendars for our second annual fall apple cider festival. From 1-4 pm, you’ll be able to press your own cider, enjoy a cider-gelato float, grab some fresh apples (and maybe even meet the farm who grew them) and savor some cider-inspired pastries. Details to come but put this one on your calendars. Posted 9/20/2018 9:02pm by Leslie Cooperband or Wes Jarrell. There is a recurring theme to the change of seasons this year. Unlike years past where one season gradually fades into the next, each respecting the others’ boundaries, this year’s seasons bleed into each other. Winter bled into spring, leaving snow and dormancy in its wake. Summer reverse bled into spring, giving nature very little time to adjust to the brusque cold-hot pivot. On reflection, spring never really made much of an appearance, save for the fruit tree blossoms and the songs of the trilling toads. Summer settle in early and decided to stay for a good long while. She bellowed out so much hot wet air in June that the stagnant seedling crops shot themselves out of the ground and clamored toward the sky. Within weeks, the weeds were a carpet and the tomato vines were so thick the trellises could no longer support them. Summer seeded clouds every so often, which discharged their moisture when they got too full to hold anymore. The lush vegetation perspired like a nervous teenager, and the heat and humidity conspired to regenerate themselves for weeks on end. Fall tried to make an appearance in early September, pushing the gulf stream southward toward the gulf, but summer rebelled and pushed the gulf stream northward just for spite. As we approach the autumnal equinox, the fall may win the latest match. The shortening days and senescent grains belie nature’s plans; there’s even talk of frost in the coming week. The neighbor farmers have begun the annual grain harvest. Soon, they can turn off the air conditioning in their tractor cabs and finally set it to heat. It’s time. Text Message Customer Loyalty Program: This week’s text club special encourages you to stock up on cheese. To get the message with the special info, you’ll need to sign up: text either “GOAT” or “URBANA” or “FARMSTORE” to 30500 to sign up. The forecast is calling for cool and sunny weather-perfect for market shopping. We have some special seasonal cheeses as well as gelato flavors for you, so come out and support your local farmers this Saturday. This is the time of year when summer produce is still abundant and fall crops are starting to make their appearances--even seasonal vegetables and fruits bleed into each other! Goat Milk Feta: Tomatoes are still plentiful and delicious. With the cooler weather, why not roast some tomatoes with crumbled feta and fresh chopped herbs? Blushing Goat: our take on a washed rind cheese—these little rounds are washed with a kombucha beer for one month. These blushing pink-orange beauties have a dense gooey-fudgy paste with a rich umami flavor. If you haven’t tried it, ask for a taste. Try it with caramelized onions or some prosciutto on a crostini. If haven’t figured out yet where we are at the market this year: we have a new spot at the farmers’ market--Urbana Market at the Square. We are in spot #20 on the south-west (along Illinois Street) end of the market. We are right next to Moore Family Farm. The outdoor market goes until the end of October this year, then we will be moving inside Lincoln Square Mall. Enjoy the changes of the season. 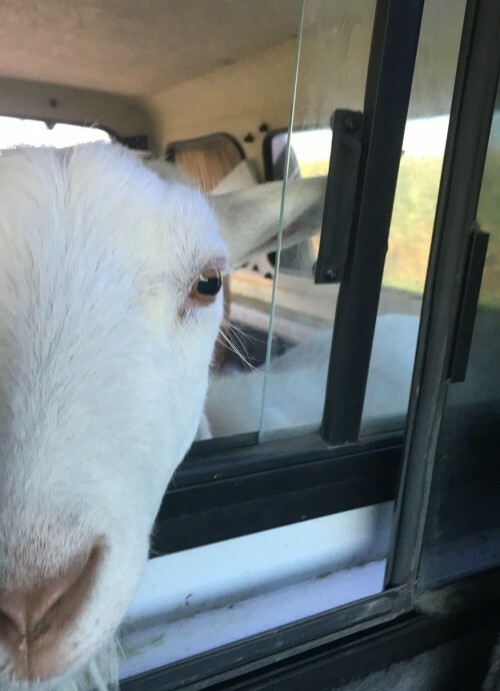 Come visit with the goats. They love to be petted, and they might try to trick you into feeding them some hay. Shop in our farm store: “The Real Stand.” We’ve got pasture-raised meats and poultry from Bane Family Meats, frozen artisan sausages from Piemonte Sausage Co., pickled veggies and pesto by Sarah (our former gelato maker), locally-grown and milled flours by The Mill at Janie’s Farm and much more. Apples from Red Crib Acres (formerly Wolfe Orchard) in Monticello-we have three varieties of their earl fall apples. Come try them and take home a bag. Farm Dinners: Fall season is upon us, and most of the farm dinners sold out already. I encourage you to book your tickets now for the two remaining dates (Oct. 6th and December 8th). The beer dinner on Saturday, October 6th will now feature Bane Family Meats pastured pork and beers from Triptych Brewery. Guest Chef, Mark Hartstein (currently cooking at bacaro, champaign and was one of the co-founders of Watson’s Shack & Rail) has crafted a gorgeous and creative menu, so check it out and grab your tickets before they’re sold out!